Queer Heroes NW is a project of GLAPN and Portland's Q Center. We honor a Queer Hero for every day in June – 30 in all – as part of our celebration of Pride. We look for examples of risk, sacrifice, service, example and inspiration from individuals, living or dead, who made the world a better place for queer people. We announce a hero each day on our websites and social media pages. Just before Pride, we display all of the heroes’ posters at a reception in Q Center’s Aaron Hall Gallery, and we take a duplicate display to Portland Pride. 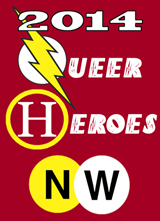 Here's the link to the main page of Queer Heroes NW 2014. Here's the link to the main page of Queer Heroes NW 2013. Here's the link to the main page of Queer Heroes NW 2012. 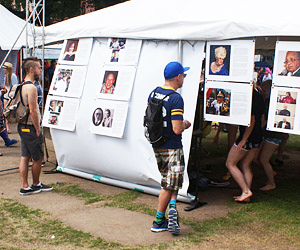 At the end of Pride, the Queer Heroes display makes the rounds of other Pride celebrations and community events around the state. Our community nominates the heroes – living or dead, representing every color of our rainbow, from every corner of our region. 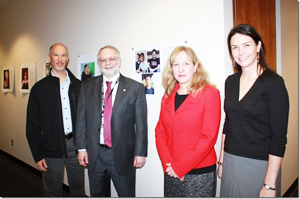 A committee from Q Center and GLAPN selects the 30 finalists. Please join us at a reception at Q Center, 4115 N. Mississippi in Portland, on Thursday, June 12, 2014, 5-7PM, when all 30 Queer Heroes posters will be on display. 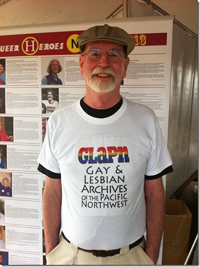 Late in 2011, GLAPN and Q Center came up with a great way to celebrate Pride. We decided to choose a Queer Hero for every day in June, announce them day-by-day on our websites and Facebook pages, and put each hero on a poster at Q Center. We looked for some combination of risk, sacrifice, service, example and inspiration from individuals, living or dead, who had somehow helped make the world an easier place to be queer. We opened nominations online, and created an online survey instrument to gather our results. Our community allies helped us spread the word. After a month of open nominations, a committee of activists and historians sat down to make the final choices. 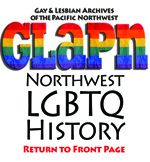 On June 1, 2012, GLAPN & Q Center announced the first Queer Hero(es) – the two individuals who began organizing the Gay Liberation Front in Portland in 1970 (link to profiles). Multiple community groups picked up the posts each day. Just before Portland Pride began, we hosted a reception at Q Center to unveil the heroes' posters at Q Center's Aaron Hall Gallery, and a duplicate set of posters went to Q Center's booth at Portland Pride 2012. Watch a video from the 2012 Queer Heroes reception at Q Center. Two Queer Heroes exhibits are made each year. The first is a set of framed posters which goes on display in the Aaron Hall Gallery at Q Center just before Portland Pride commences. The second is a more portable display. It goes to Pride, and then finds its way to other venues around the state. In 2012, the portable exhibit consisted of a set of 30 durable prints, smaller than the framed versions and designed to take the wear and tear associated with transport. One of its many stops was at the U.S. Department of Justice. In 2013, the Queer Heroes exhibit went upscale – a pull-up, movie-screen affair contributed by Bill Dickey, himself a Queer Hero for 2013. It is prettier and easier to manage than the 30 prints which comprised last year's exhibit. Its first appearance was at Portland Pride, where it appeared in a booth, co-hosted by GLAPN and Q Center, and provided thanks to a donation from New Seasons Market. 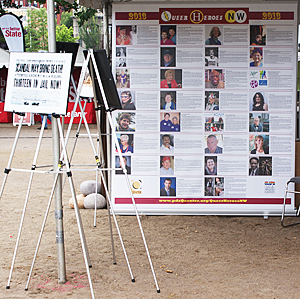 The booth provided a much-needed space to set up the Queer Heroes Northwest display where folks could pause to read without blocking traffic. It also allowed GLAPN to display some of the materials gleaned from our archives: The "Scandal May Bring Death" headline about the 1912 Vice Clique Scandal actually did stop bypassers in their tracks. Q Center actually received the donated both, made the decision to separate the Queer Heroes NW display from the Q Center program booths, and asked GLAPN if we could contribute display materials and staffing. It worked well for everybody concerned. GLAPN members got a chance to talk to local history buffs, and introduce GLAPN to folks who had never heard of us. We certainly hope for a similar opportunity next year.